Ballymore heads to Caulfield and Geelong on Boxing Day - Hiphopopotamus lining up in town whilst Tallahatchie, Marie De Guise and Claret 'N' Blue head to the provincials. A horse who improves as he steps up in distance, Hiphopopotamus looks a nice chance in the Dennis Hanrahan Handicap - the third event of the day, the six-year-old stepping up to 2400m for the first time this campaign. "He has had enough racing and he is at the right distance," Michael Moroney said, "he has been improving nicelyiand he looks to be in with a good chance." Hiphopopotamus won staying races at Bendigo and Moonee Valley last time in and will be parterned at Caulfield by Lisa Cropp - due to jump from barrier 5. The first of our Geelong runners is Tallahatchie who contests the opening event, the Geelong News Maiden Plate over 1325m with Ryan Maloney to ride. "He has drawn awkwardly," Moroney said, "but his first up run off a long spell was very good and he hs improved enough to be a decent chance." A game fourth when resuming, Tallahatchie is a horse who has always shown ability - finishing in the placings at his first two starts this time last year. Being a son of High Chaparral he is bred to improve with maturing and has looked well this time in. Imported mare Marie de Guise showed improvement at only her second run this preparation - stepping up from 1400m to 1600m and the 2240m of the Geelong Info Handicap will prove all the more suitable. "There was merit in her last run," Moroney said, "and over this longer trip she should start to find form." Fellow import Claret'n'blue lines up in the final event at Geelong - the Geelong Advertiser Handicap over 1733m. An easy maiden winner at Warrnambool two starts ago, the son of El Prado was a little below his best at Ararat last time out. 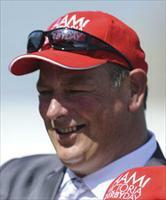 "He was pressured a bit early," Moroney said, "but he was still slightly disappointing." "However he may have been a tad light going into that race and he has improved." Ballymore hopes everyone enjoyed a wonderful Christmas and we wish you all the very best for the New Year!